Animal Wildlife | Chimpanzee | The chimpanzee (chimp) is one of the largest primates, with the chimpanzee being most closely related to the human, the gorilla and the orangutan. 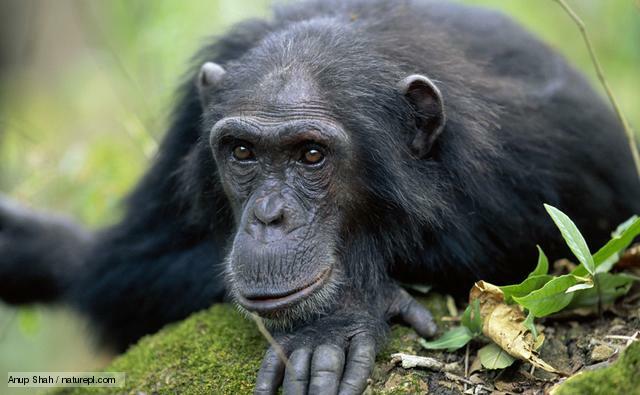 The chimpanzee is native to Africa. 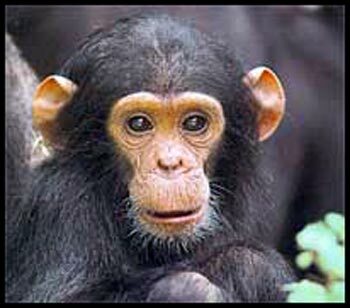 There are two different species of chimpanzee, the common chimpanzee and the pygmy chimpanzee. These two species of chimpanzee are separated by the African Congo river so dont really come into contact with one another. The chimpanzee is slightly smaller than the other large primates, with the average male chimpanzee getting to around 4ft tall. The chimpanzee lives until its around 52 years old, but chimps have been known to get much older in captivity. 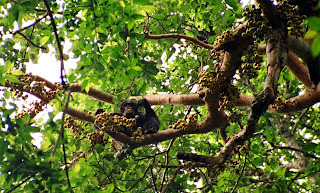 The chimpanzee is known to be a highly intelligent and sophisticated primate as the chimpanzee will regularly make tools to help the chimpanzee to get food. The chimpanzee also uses these homemade tools in social displays when attracting females and also in a method of defense. 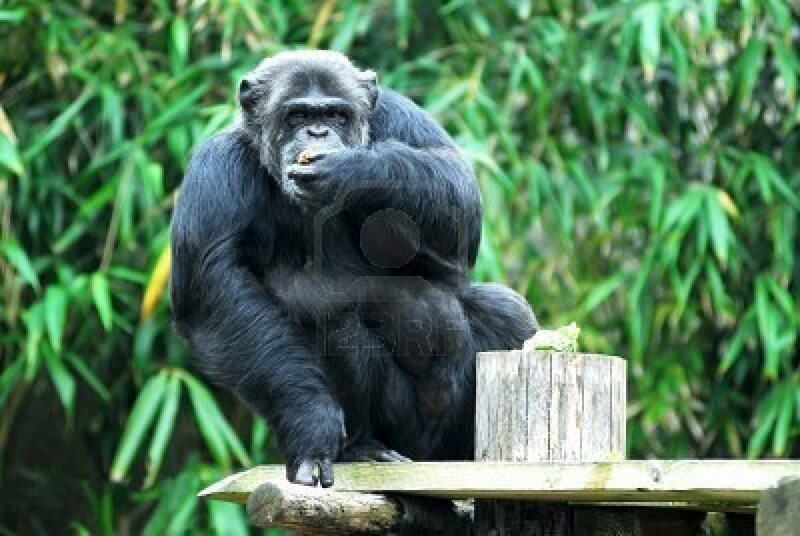 The chimpanzee is an omnivore meaning that the diet of the chimpanzee consists of both plant and animal matter. 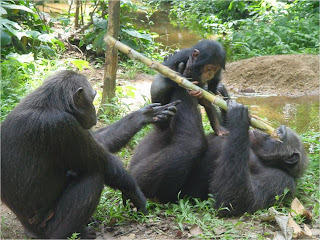 When the chimpanzees hunt, they use complicated strategies which require the chimpanzees to work together, stick to their rank within the chimpanzee troop and also means that the chimpanzee needs to be deceptive in some situations. The chimpanzee troop consists of around 30 chimpanzee members, and these chimpanzee troops contain a mixture of female chimpanzees and male chimpanzees. As with other large primate groups, the alpha male chimpanzee is the largest and strongest of the male chimps and has control over mating and looking after his chimpanzee troop. Chimpanzees are highly territorial mammals and will fight off any unwelcome intruders into their chimpanzee territory. On a darker note, it has been known for chimpanzee troops to kill and eat those chimpanzees that trespass on their turf. Chimpanzees communicate through a series of vocal sounds, hand gestures and facial expressions. 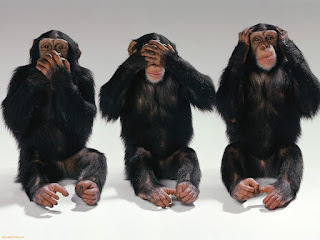 Studies have shown that the part of the brain which the chimpanzee uses to communicate, is similar to the part of the brain that human beings use for language. The chimpanzee has also shown that it is able to understand basic forms of human communication and the chimpanzee is incredible at remembering number sequences. The foot of the chimpanzee is well suited to walking as the chimpanzee has broad, hardened soles and short toes to help the chimpanzee to balance. The chimpanzee has four fingers or toes on each of its feet and one opposable digit that the chimpanzee uses to help the chimpanzee to hold onto branches as it climbs. 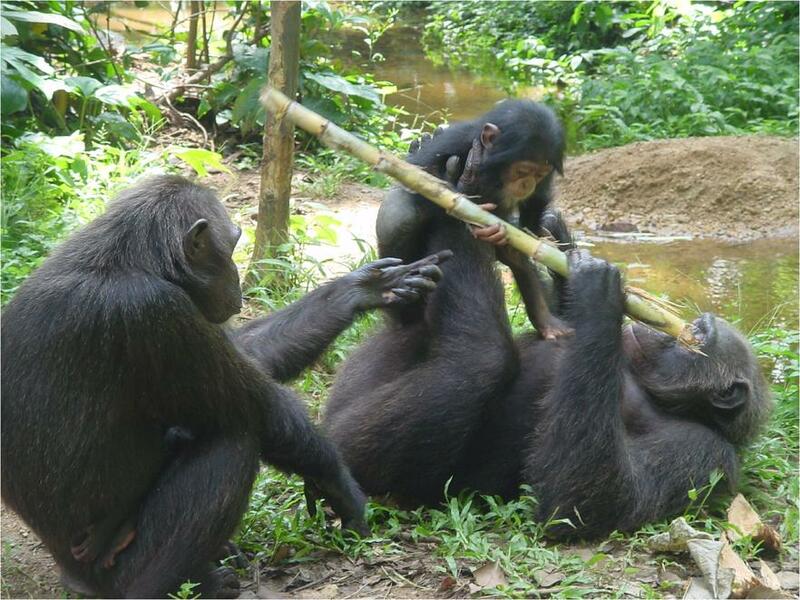 The chimpanzee has very dexterous fingers and is able to build tools out of the surrounding forest in order to help the chimpanzee to catch food and defend off unwanted predators. The feet of the chimpanzee are longer than stronger than the hands of the chimpanzee as the chimpanzee spends a great deal of time walking on two feet with the opposable toe helping to balance the chimpanzee. The chimpanzee uses both its hands and feet in order to climb quickly up trees and to swing from branch to branch. 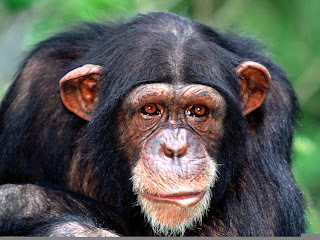 The chimpanzee uses its teeth to reflect its emotions, for example the chimpanzee will smile when it is relaxed whereas a frightened chimpanzee will bare its teeth to intimidate the threat. The teeth of the chimpanzee are very similar to the teeth of humans although the chimpanzee has larger and more pointed fang-like canines at the front of its mouth. The chimpanzee has 32 teeth with 16 of these teeth being on the upper jaw and 16 teeth being on the lower jaw. The teeth of the chimpanzee begin to grow before birth and scientists can therefore work out how old a chimpanzee is by looking at the lines in its teeth. The chimpanzee uses its specially shaped molar teeth to grind up fibrous matter such as certain fruits and leaves.